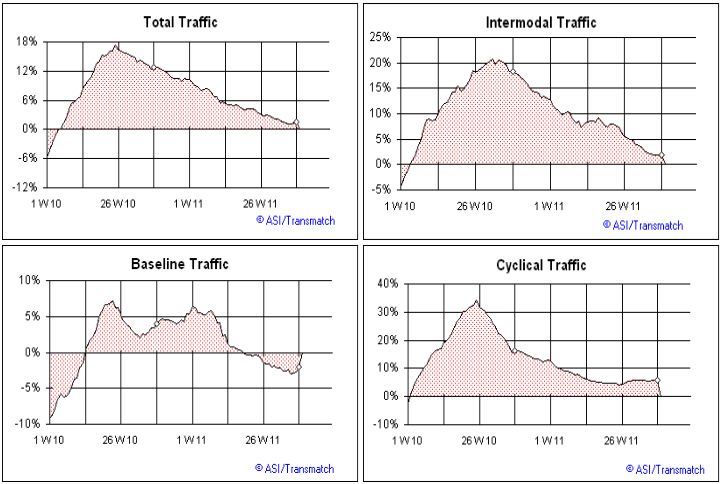 Weak shipping reports have now spread to rail traffic, truck traffic, and ocean shipping. We will look at each of those in turn, but first a brief recap on the Unprecedented Drop in Port Traffic: A Sobering Omen for Holiday Sales. The five busiest container ports in the United States said that imports in August 2011 were lower than or even with 2010 volumes. In Long Beach, the second-busiest container port by volume, August imports fell by 14.2 percent from August 2010. 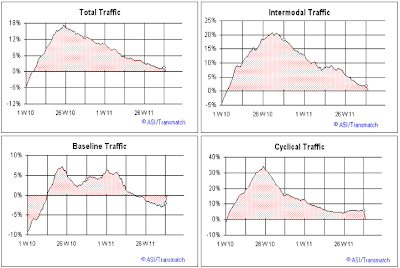 The steady deterioration in the rail indices is obvious. The next set of charts is even worse. Please consider the Ceridian-UCLA Pulse of Commerce Index®, September data. This is alarming news for the third quarter and beyond. In the last three months, the PCI has declined at an annualized rate of 10 percent per year as illustrated in the figure above. This rate of decline has been exceeded only in the deep recession of 2008/09, and equaled only once outside of a recession in March 2000. In other words, since June, trucking activity has been receding at a pace that would be expected to show up in other economic measures soon. 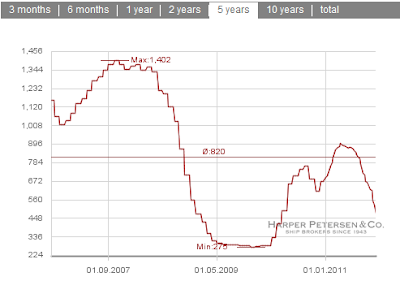 Two or three more months like this would confirm an official recession. 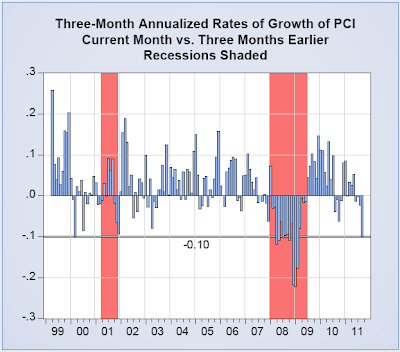 With the past three negative months, the PCI declined at the annualized rate of 4.3 percent in the third quarter of 2011 compared with the second quarter. Outside of the recessions, we have never experienced such a large quarterly decline in the PCI. Our near-recession situation is made only slightly less concerning by two facts: the declines in the recessions have been much larger than 4.3 percent, and the PCI decline in 2011Q3 is almost as much in 2003Q2. October 12, 2011 3 With hopes that the September data would be positive, last month we wrote, “Based on the July and August data, the PCI will likely decline in the third quarter and this suggests GDP growth of zero to 1.0 percent.” Due to the disappointing September number and the consequent third quarter 4.3 percent decline of the PCI, it will be difficult to get a positive GDP number in 2011Q3 — but trucking activity tends to lead the economy, and the effect of the positive growth in the PCI from 2011Q2 lingers on. As such, this makes the PCI-based forecast for third quarter GDP growth equal to zero, meaning just as likely to be negative as positive. More ominously, the last weeks of September were the weakest, promising more of the same in October. The positive point of view on this extremely disappointing news is that businesses, in the face of the considerable concerns about growth, appear to be unwilling to restock for a potentially vibrant holiday season at the same time as normal, and they are planning to ramp up inventories late this year, if and when the sales start to materialize. In other words, what we are observing this month is only a weak forecast of future sales, a forecast that doesn’t have to be self-fulfilling. With lean inventories, increases in sales mean increases in production and in jobs. Viewing the PCI as a measure of inventories in motion, it appears that inventory restocking in 2010 got ahead of real retail sales, and the decline in the PCI in the second half of 2010 was an indication of inventory reductions realigning with sales. 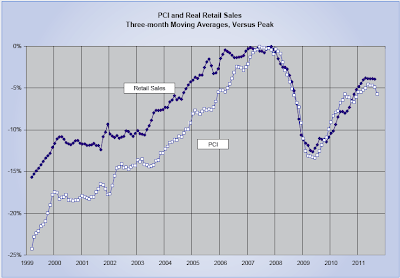 This year we have experienced an ominous cessation of growth of both the PCI and real retail sales, and now in September 2011, a sharp decline in the three-month moving average. 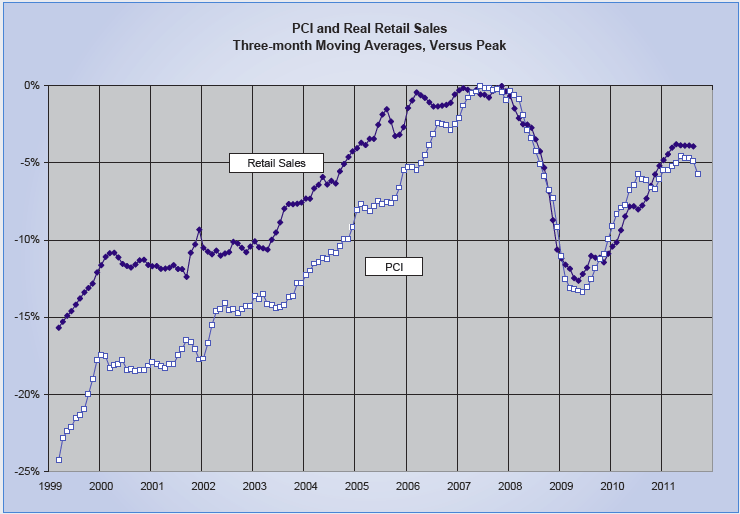 In the coming months, we are going to see either an improvement in the PCI or a deterioration of real retail sales. Your story about the unprecedented drop in port traffic reminded me of something I recently noticed about shipments that the company I work for gets from Asia. I work for a major publisher in New York City that prints many of its titles in Asia due to lower costs. What we've noticed in the past several months is that shipments of our books get delayed due to a lack of ship traffic from Asia to N. America. Basically what happens is our stuff gets printed and then it waits for weeks at the docks until the ship is full and ready to transport the cargo. To give you a perspective, it takes us twice as long now to receive stock from Asia than it did two years ago. For all intents and purposes we're a relatively 'poor' industry so we're likely at the back of the line in terms of preference but it cannot be denied that there is excess capacity and that no one is interested in increasing it because there clearly is nothing to ship. 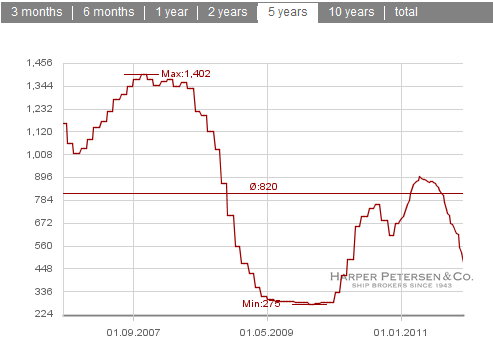 Without question this is yet another sign of the various deflationary pressures that the economy is under. From what I see at Walmart and Target, those two stores have visibly reduced their inventory. Even grocery stores seem to have reduced inventories. Also look at how many stores are advertising "layaway" for the holidays and all the online stores offering free shipping. It sounds like a lot of retailers are expecting a bleak holiday season. I remember a year ago Gerald Celente said Christmas was going to evolve into a holiday that centers around religious festivities and traditional food, with gifts being greatly diminished or eliminated except for small children. We only buy gifts for children. The adults don't need anything and we have almost everything we want. We'd prefer to just keep our money and our sanity. I'm tired of crowded stores and trying to find a gift for those who don't need anything. Actually, the best thing to give to kids these days are silver coins. They will grow up with a fond memory of the reward that comes from saving. Collectively the various shipping reports tell a story of very weak Christmas demand. Consumer demand can change on a dime, but there is no reason whatsoever to expect it to do so. The jobs market has been exceptionally weak, real wages are down, sentiment is down, and small yet unprecedented protests have spread to Wall Street. Globally things look worse.